Expert facilitation for new ideas, innovation and strategic planning. Are you looking to kick-start progress? We’ve helped clients prioritize customer experience issues and brainstorm new products. We’ve helped teams develop a vision of the future. All our events are custom designed to meet your exact needs, using a wide variety of proven tools and techniques. Together we will design a detailed plan for the event – including your involvement as a leader. Together we will choose from a wide range of creative activities that will keep your team energized and doing their best thinking. Capture your team’s knowledge and build new ideas on solid foundations. Example techniques we have used include Speed Bumps (problem identification), and Facts In Five (sharing key facts). Perhaps your team needs to get more immersed in the customer experience. We’ve taken teams on bus trips, sent them on shopping excursions, and provided unique homework assignments. Creating a persona for the one ideal target customer, or the multiple unique segments, provides an exceptional focal point for testing new ideas and concepts. Finding the right question is the first step towards getting a new answer. We use a variety of brainstorming techniques to uncover the questions, then prioritize. Being playful in a structured environment can reveal new approaches to problem solving. We use collages, objects, and physical movement like the Process Improvement Ball Toss to help people tap into fresh thinking. Roadmap to Results™ is a unique visual tool used to capture a top-level project plan: the challenge, the ideal result, the subject matter experts, success factors, how things will be different in the future, obstacles and resource requirements. Take it home from the workshop and get started. There are many ways to brainstorm. Learn the methods the pros use to get more and better ideas. 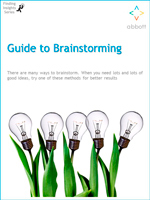 Download the free Guide to Brainstorming. How can a specialty telecommunications company in a demanding B2B space develop better quality? Multiple re-organizations had left this small division of specialty engineers, senior sales and service staff frustrated by the barriers they had to jump to meet customer needs every day. A half-day window opened at the annual company-wide kickoff event. Careful design, and an advance knowledge harvest assignment for participants were key in this facilitation event. By the time lunch rolled around, we had successfully identified the major barriers, prioritized the top five, and small teams were starting to plan solutions. We created new tools specifically for this project, to ensure delivery of results within a very tight window.